Unknown to most people it is possible to open Excel files in slightly different ways. Typically this is used when working with a corrupt file ( see Repair Corrupt Excel Files) but there are some other Excel Open As Options as shown below. Allows you to open the file as Read Only even if it is not set as such.Useful if you want to protect yourself from accidentally making a change. Opens the file in your internet browsers. It needs to have been saved as such, so it is not always available as an option as shown above. Similar to the Read Only option except if you do decide to make a change you can click the Enable Edit button and proceed, instead of closing and reopening the file. 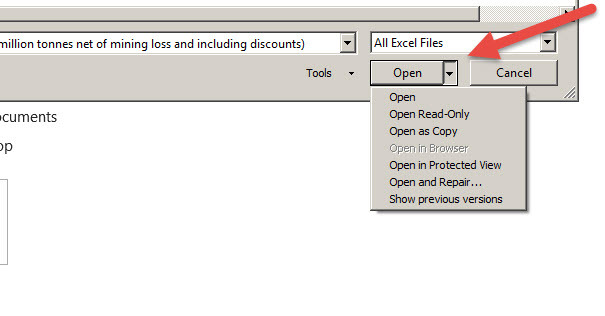 If Excel has some previous versions it will allow you to open them.